5 stars of insightful and beautiful anime. 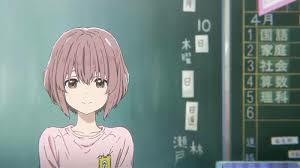 A Silent Voice is based on the manga of the same name written and illustrated by Yoshitoki Ōima. The screenplay is written by Reiko Yoshida and the film is directed by Naoko Yamada (K-On!!). The film opens with our protagonist Shōya Ishida (Robbie Daymond – Final Fantasy XV) getting all of his personal effects in order and heading out to jump from a bridge. At the last moment, he changes his mind and thinks back to his Junior High School days and the start of all his troubles. 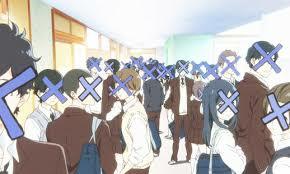 Shōya is a popular student with plenty of friends. However, the class dynamic is drastically changed one day by the arrival of a new student, Shōko Nishimiya (Lexi Cowden). Shōko is deaf and communicates by way of a notebook. Although the other students are sympathetic at first, there is some resentment at the extra burden this places upon them. Shōya picks up on this but takes it to a whole new level, constantly bullying her, stealing her hearing aids, shouting behind her head and generally making her life a misery. She is finally removed from school as a result of this and his mother feels obliged to pay for the hearing aids. Although all his classmates were party to the bullying and didn’t step in to help, they refuse to stand by Shōya, instead ostracising him and subjecting him to the same torment as he dealt out to Shōko. 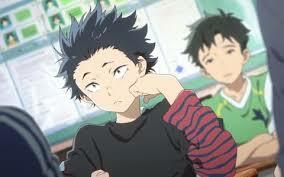 As a consequence, by the time he reaches high school, he has no friends and is unable to look anyone in the eye. It is then that we first met him, about to jump from a bridge. In that moment he makes a decision, he will find Shōko and try to make amends for what he did. Can they be reconciled or is it too late for both of them? 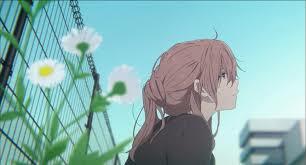 A Silent Voice is an extremely well written tale of two people who have no idea how to help themselves, but desperately want to help each other. It also offers an honest and down to earth depiction of bullying and it’s consequences, something with which most people will identify on some level. It certainly makes you think. The animation style is beautiful, there are some very interesting ideas and the whole thing is enhanced by a well thought out sound track which adds to the atmosphere beautifully. A glorious and powerful film, well worth adding to your collection. 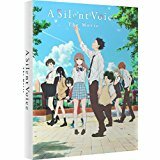 A Silent Voice is available to order now on Collector’s Edition Blu-ray and standard Blu-ray and DVD and will be released on 30th Oct 2017.